Is it just me, or is there something about a Mark's Work Wearhouse that doesn't scream "authentically Greek?" Yet right in the middle of Greektown Toronto, at the corner of Danforth and Gough, the Canadian Tire sister chain has set up camp, giving its automatic doors a hefty workout in the few years since its inception. 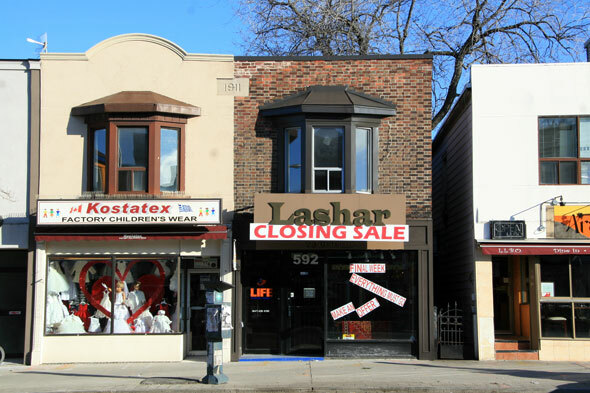 It's less busy across the street, particularly on the strip of the Danforth between Gough and Carlaw, where four storefronts are now for lease, while another advertises a closing sale. As I continue walking west, I discover more; Athenian Originals Children's Wear has closed up, same with Iliada Cafe and Pikilia Mediterranean Grill. And who's moving in? Well, all sorts of different places. 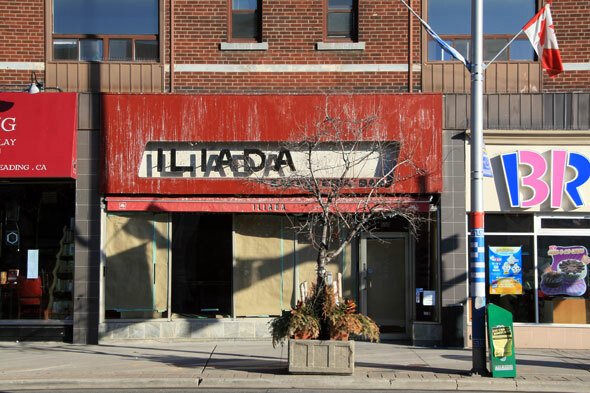 Some sushi restaurants have sprouted up, a Kernel's a couple of years ago, there's Ardene, a Legs Beautiful, Tsaa Tea Shop, Aravind, Pizzeria Libretto and a new Dolce Gelato slated close to Chester station. And while the incoming businesses are all of varied mold, most share one distinct characteristic; that is, they're not Greek. So while Mark's may have once seemed the odd man out, if Greektown keeps heading in this direction, it may soon be less the anomaly than the trend. The businesses that are closing down are disproportionately the Greek ones, many of which were independent and family-owned. 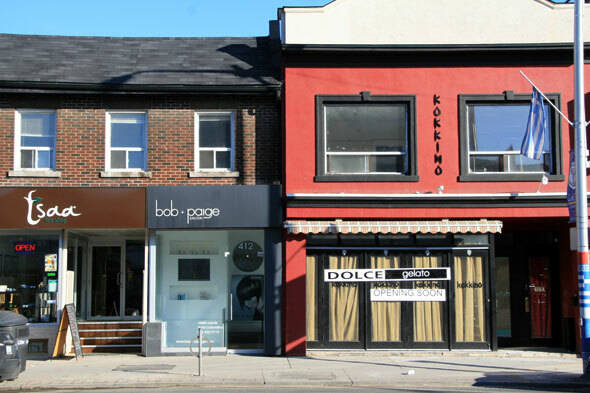 As I went to talk to business owners on the Danforth to find out why, I kept hearing the same thing over and over: the rent is just too high. "I use to work in real estate," a woman behind the counter at Athena Bakery tells me. "And I know that these rates are just astronomical. Then, when you factor in property taxes, which sometimes the business owners have to pay part of, it becomes too much." "In the '80s, my father had a store here," she continues. "But when his lease was up, and the landlord wanted to raise it to $5,000 a month, he said, 'Enough!' and packed up and moved off the Danforth. I think the same thing is happening now." 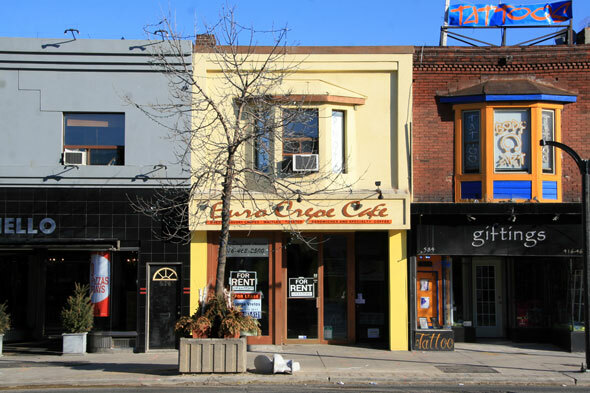 I called a few of the spaces up for lease, and found they were going for anywhere from $25 per square foot to $40 per square foot for one particular 5,000 square foot retail space. "When it gets so high," the woman said, shaking her head, "only the big chains can afford to move in." But according to one of the owners I spoke to at Greek City down the street, that's not necessarily a bad thing. "The chains bring in new clientele; they bring in the non-ethnic demographic that might not come here otherwise," she says. "The problem I have is with all of the sushi places moving in. They don't do anyone any good except for the sushi places themselves." "But I have noticed things changing, especially in the past two years," she continues. "People just don't have the money to spend when they go out like they used to." That's part of Chris Collins' theory, who owns Corner Lot Home DĂŠcor just east of Pape. "I think the issue is threefold," he tells me. "One: the rents are insanely high. 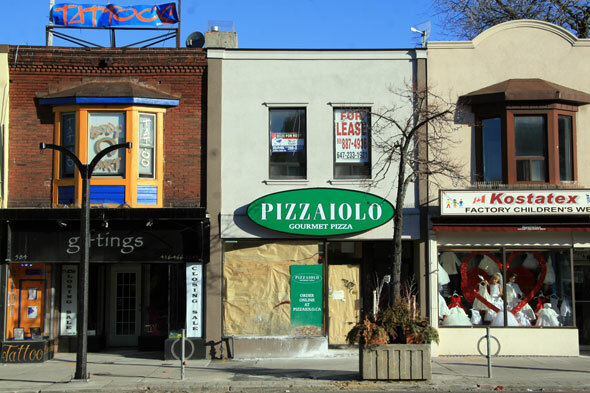 Two: many of the older businesses owners are retiring and their kids don't want to take over [the woman I spoke to at Athena said she knew of at least one closure that was due to this scenario], and three; the Danforth residential is changing." Collins says he's seen the demographic shift from older couples to young families, many of whom don't have the money to pay for evenings out. "It used to be that people in the area would go out to Greek restaurants three or four times a week," he says. "But now, you have young couples who have just put a massive down payment on a home, and they don't have the money to do that sort of thing. And as a result, the businesses begin to suffer." Collins says there's also more diversification in terms of who's moving in. "It's not just Greek families anymore." And while more diversification in terms of businesses isn't necessarily a bad thing, the worry is that it will go too far. As my conversation at Athena draws to a close, I catch the woman behind the counter glance out the window and heave a solemn sigh. "I'm really sad to see this area becoming less Greek," she says. "I'm afraid the only thing still Greek in a couple of years will just be the signs."